David Call’s Art Masterpiece – …And the Truth Shall Set You Free. In The Crucifixion of Sign Language, David Call’s work manifests the faults with not only religious aversion itself, but also the ethic moral value system inherited from it. This artwork I consider a further development, his ideas concerning religion, particularly the idea that be presented in language morality that is the inversion of a true, noble language resurrection. One of the most important of his ideas is that 85% of people (delegates) who have voted to kill sign language are religious and have made Deaf people nihilistic and feebleminded and mocked their inherent rights to sign language. Crucifixion symbolizes resurrection; The Crucifixion of Sign Language symbolizes the language and culture resurrection. I was really intrigued by how David Call, in this artwork, is able to show the tension in traditional values of the Deaf people amidst a time of cultural and historical change. 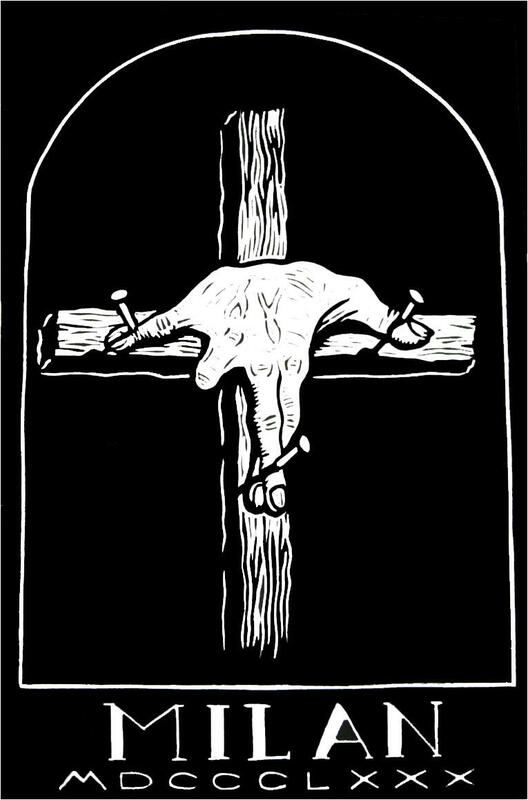 The artwork illustrates this time of great cultural change of the Deaf people in its depiction of The Crucifixion of Sign Language coming into Deafhood—the cultural resurrection—and finding their social place within their sign language. Not only that, but also Deaf people’s rights to sign language as their language are recognized as the rewards in the Deafhood, leading to their resurrection in personal and cultural levels. David Call illustrates the life of the sign language through art and storytelling. After the 1880 Milan Resolution forcing all the Deaf people to learn oral articulation and banning their hands to manipulate instead, it is clearly the symbol of a political and power-playing that has steeped into the consciousness of the Deaf people who struggles to survive. As Deaf people are suddenly faced by the language “massacre” by the international invasion of oral education. Deaf people have dealt with the language crucifixion; however, it is not out of hatred or decadence, but for a good reason: to resurrect themselves. The Deaf people’s will for survival is, as Call asserts in his masterpiece, the most powerful “vital energy” in history, and I am sure Call has admired those who struggled mightily to survive and prevail. The values which ultimately matter are not a prestigious and personal honor but rather a collective responsibility, survival, and preservation of the old ways in ever-changing political and cultural climates. All those who wish not to renounce life, but to affirm it, all who seek to proclaim a triumphant “yes” to the resurrection of human prosperity, knowledge, and happiness, will find in The Crucifixion of Sign Language an invaluable insights into how the resurrection can be achieved—and into what stands in the way of their being Deaf. Thank you, David Call for providing a thought-provoking art masterpiece. It is not what I have expected, and I continue to be extremely challenged by much of this artwork which is very engaging. This is a good metaphor–an intellectual activity that requires deep thinking, deep translating, deep transforming. Outstanding! Reblogged this on The Last Hiccup.